Sometimes advances in veterinary medicine don’t come in a pill, but rather in a shift in perspective. That seems to be the case when it comes to dental care for dogs and cats: over the past few decades, growing awareness among both veterinarians and pet owners alike about the importance of good oral health for companion animals—combined with clinical advances, better dental instruments, and more home dental care options—is brightening the dental health outlook for companion animals. Doting, information-savvy pet owners today are more interested in their pet’s dental health than in past years, said Katherine Kling, DVM, a clinical instructor of dentistry at the University of Illinois College of Veterinary Medicine. “It’s more common now for people to know that they can take care of their pet’s teeth the same way that they care for their own teeth,” she said. Periodontal disease affects almost all dogs and cats. 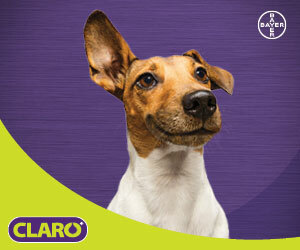 By age 3 most dogs and casts exhibit signs of periodontal disease, according to the American Veterinary Dental College. 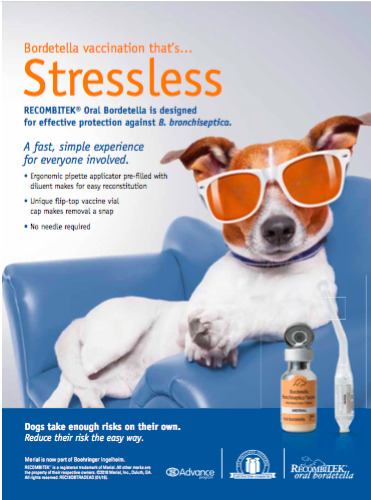 The Banfield 2016 State of Pet Health report found that 76 percent of dogs and 68 percent of cats have dental disease, based on its analysis of medical data from the 2.5 million dogs and 500,000 cats treated at its facilities across the country. 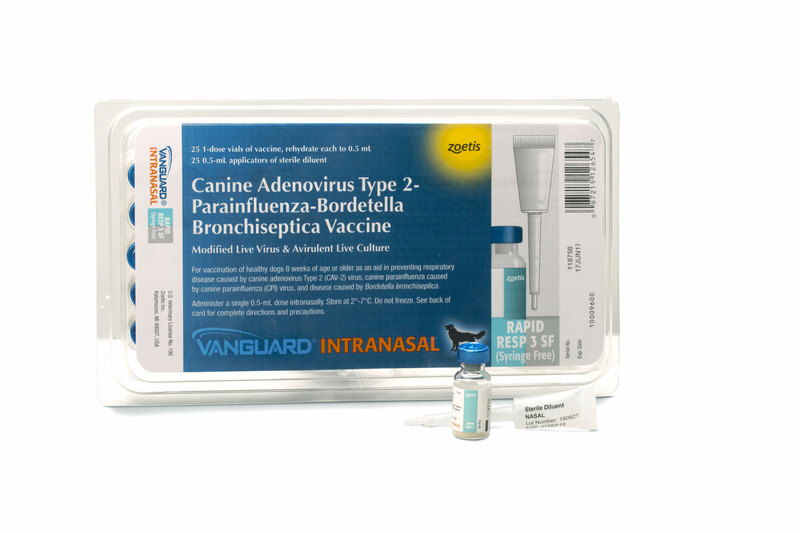 Dental calculus is the most common condition diagnosed among pets, according to the Banfield report. Dental problems cause not only pain, chewing difficulties, and tooth loss; periodontal disease is also associated with systemic health problems. For example, a 2008 Journal of Veterinary Dentistry study found that the extent of periodontal disease was positively associated with the likelihood of the dog to have heart, liver, and lung damage, and a Veterinary Quarterly study determined that treating periodontal disease in cats lowered markers of systemic infection, including serum IgG and eosinophils levels. Veterinarians today have access to more resources and information on pet oral health than they did in years past, noted Barden Greenfield, DVM, DAVDC, president of the American Veterinary Dental College who has a pet dentistry practice in Memphis, Tenn., and Little Rock, Ark. The topic is being taught in more depth in veterinary schools, he said, and conferences like the Veterinary Dental Forum are broadening veterinarians’ knowledge of animal dental issues. This increased knowledge, in turn, is prompting many veterinarians to recommend cleanings and radiographs to pet owners starting when their animals are only a year or two old, rather than waiting until the pet is older and has developed dental disease—in other words, to be proactive, instead of reactive, Dr. Greenfield said. Part of that proactive approach is encouraging pet owners to regularly brush their pet’s teeth—although most pet owners do not. A 2016 Canadian survey commissioned by Royal Canin and conducted by the market research firm Ipsos found that only 6 percent of cat owners and 15 percent of dog owners brush their pet’s teeth daily or a few times a week—but 80 percent of dog owners and 84 percent of cat owners strongly agreed or somewhat agreed that brushing their pet’s teeth was important for the pet’s dental health. And although nothing can take the place of regular brushing, a plethora of dental chews, treats, water additives, gels, sprays, and wipes are available for pet owners to supplement dental care for their animals. 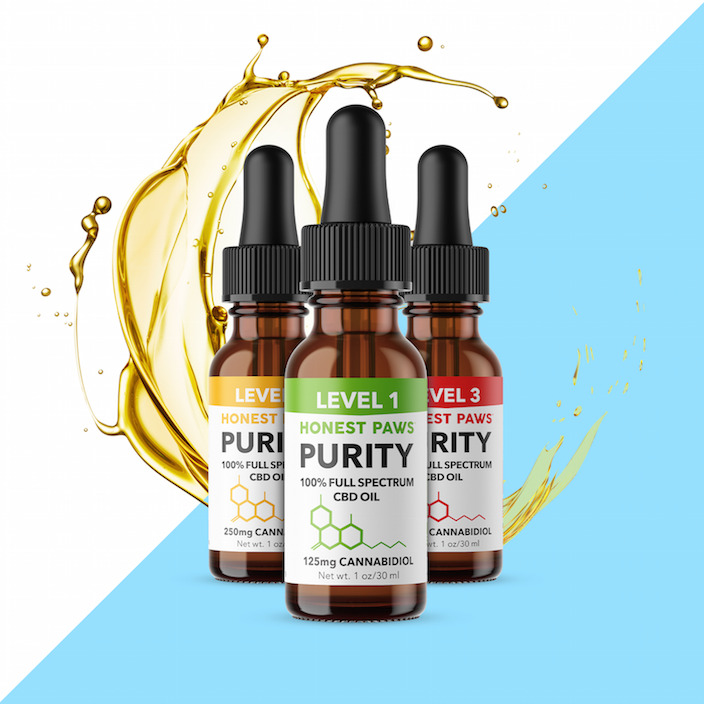 Sifting through the array of products available to determine which ones will truly help can be daunting for vets and pet owners alike, though. That’s why dental veterinarians recommend that pet owners look for products accepted by the Veterinary Oral Health Council (VHOC). The council, established in 1997 as part of the American Veterinary Dental College, comprises nine dental veterinarians and researchers who review data voluntarily submitted by manufacturers on the efficacy of their products at controlling plaque and tartar. Products that meet criteria established by the council are awarded the VOHC Registered Seal. The dozens of accepted products include chews, treats, dry food, water additives, gels, and wipes. A proactive approach to animal dental care also means educating pet owners on the importance of regular dental cleaning under anesthesia so the veterinarian can perform a thorough oral examination and dental cleaning beneath the gum line. That’s especially important at a time when more pet owners appear to be opposed to dental cleanings under anesthesia for their pets and are pressing their veterinarians to perform dental cleanings without anesthesia instead or taking their pets to groomers who also scrape a dog’s teeth. Fear of putting their animal under anesthesia and concerns about the cost of a dental cleaning are why pet owners are interested in a nonanesthesia alternative, said Dr. Mulherin. But that’s not an effective alternative for removing plaque beneath the gumline or thoroughly assessing the animal’s oral health, say veterinary dental specialists. It’s like “washing a car without looking at the engine and saying your car is in great shape,” said Greenfield. While teeth scrapings between annual cleanings might be a helpful adjunct, it can’t take the place of cleanings under anesthesia, he said. in veterinary practices over the past decade, is faster and provides better quality of images, making it easier for veterinarians to diagnose dental problems, said Greenfield. 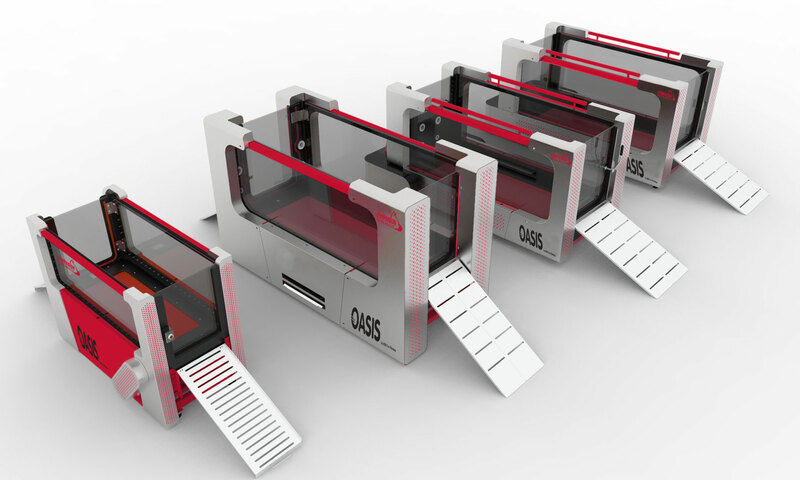 “It’s like looking at a tricycle and then a Ferrari,” he said, comparing the difference between a film and digital image. Digital radiography has made it easier for veterinarians to diagnose and treat tooth reabsorption in dogs and cats, said Mulherin. Ultrasonic scalers have become more sophisticated over the past several years, enabling vets to clean an animal’s teeth with less stress to the teeth and gums, while enhancement like LED lights and magnification features make it easier for vets to see inside the animal’s mouth, Greenfield said. Additionally, materials for crowns have become more durable and cements are stronger, as well, he added, making crowns a more feasible option for companion animals with cracked or broken teeth. 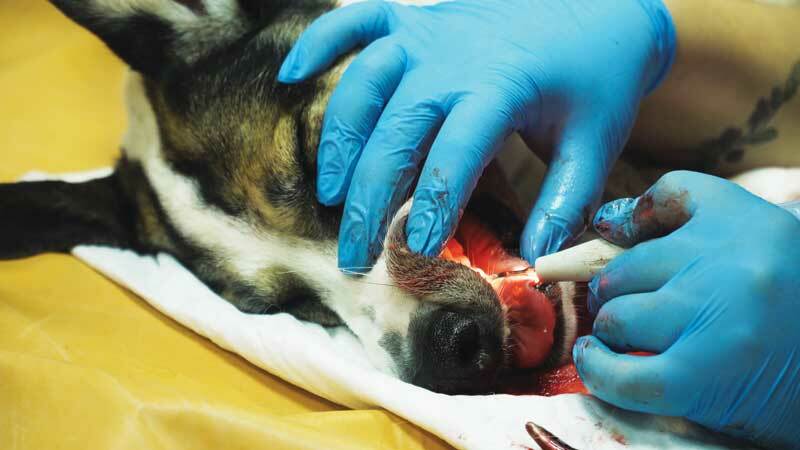 Dental sealants are also helping to mitigate periodontal disease in dogs and cats by making the tooth surface under the gum line slippery and less hospitable to plaque development, said Dr. Kling. One sealant, the Sanos dental sealant, received the VOHC seal of acceptance in 2011. Strides have been made in caring for dogs with jawbone loss due to injury or disease as well. The University of California, Davis School of Veterinary Medicine pioneered at technique for regenerating jawbone using bone growth protein. In this technique, developed by veterinarian surgeons Boaz Arzi, DVM, DAVDC, and Frank Verstraete, DrMedVet, DAVDC, a collagen and ceramic scaffolding is infused with bone morphogenetic protein and attached to titanium plates affixed to the dog’s remaining jawbone. Over the course of several weeks, the protein stimulates the generation of new bone tissue, which gradually grows to fill in the missing piece of jawbone. The surgeons have performed about 36 bone regeneration procedures since 2012, and it’s now considered a standard treatment, said Rob Warren, UC Davis Veterinary Hospital’s communications officer. Advances are being made in using stem cells to treat the painful condition of feline gingivostomatitis, a severe gingival inflammation that is commonly treated with steroids or by extracting the cat’s teeth to remove the source of oral bacteria. 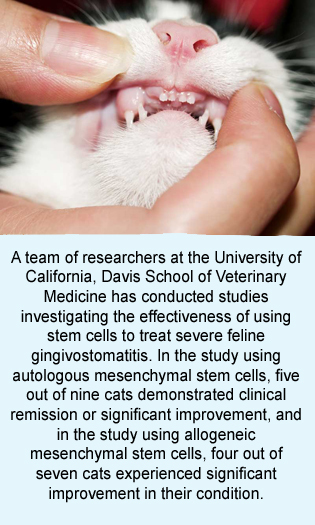 A team of researchers at the UC Davis School of Veterinary Medicine has conducted studies aimed at investigating the effectiveness of using stem cells to treat severe feline gingivostomatitis. In the study using autologous mesenchymal stem cells, five out of nine cats demonstrated clinical remission or significant improvement, and in the study using allogeneic mesenchymal stem cells, four out of seven cats experienced significant improvement in their condition. 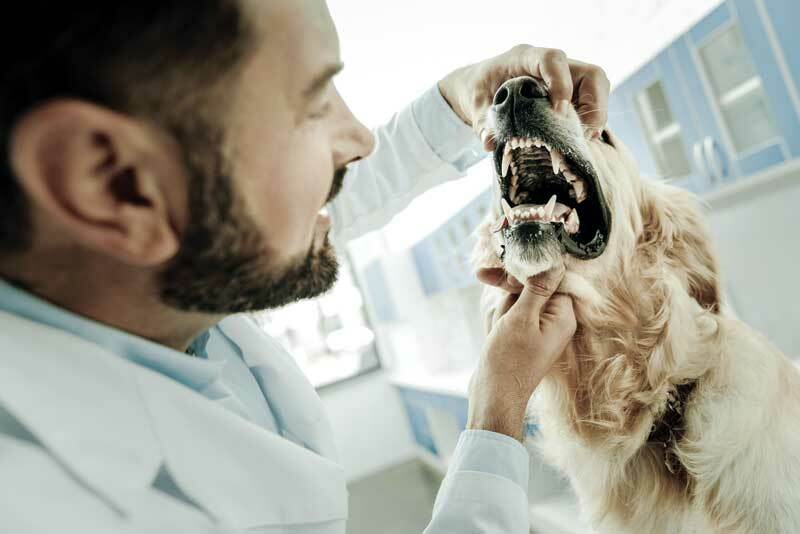 As dental therapies for companion animals continue to increase and improve, veterinarians need to be an advocate for the oral health of their furry patients, Greenfield said. Indeed, their knowledge and enthusiasm for pet oral health will influence how the pet owner views the importance of dental care for their animal. “If the veterinarian is passionate about dental care, then it is very likely the owner will see it and believe it,” Greenfield said.